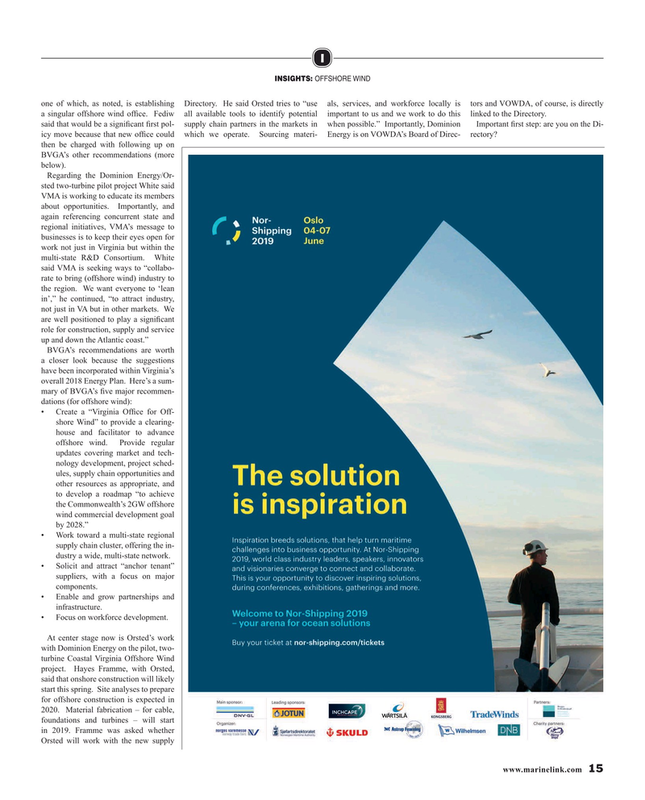 INSIGHTS: OFFSHORE WIND one of which, as noted, is establishing Directory. He said Orsted tries to “use als, services, and workforce locally is tors and VOWDA, of course, is directly a singular offshore wind of? ce. Fediw all available tools to identify potential important to us and we work to do this linked to the Directory. said that would be a signi? cant ? rst pol- supply chain partners in the markets in when possible.” Importantly, Dominion Important ? rst step: are you on the Di- icy move because that new of? ce could which we operate. Sourcing materi- Energy is on VOWDA’s Board of Direc- rectory? BVGA’s other recommendations (more below). BVGA’s recommendations are worth a closer look because the suggestions have been incorporated within Virginia’s overall 2018 Energy Plan. Here’s a sum- mary of BVGA’s ? ve major recommen- dations (for offshore wind): • Create a “Virginia Of? ce for Off- shore Wind” to provide a clearing- house and facilitator to advance offshore wind. Provide regular updates covering market and tech- nology development, project sched- ules, supply chain opportunities and other resources as appropriate, and to develop a roadmap “to achieve the Commonwealth’s 2GW offshore wind commercial development goal by 2028.” • Work toward a multi-state regional supply chain cluster, offering the in- dustry a wide, multi-state network. • Solicit and attract “anchor tenant” suppliers, with a focus on major components. • Enable and grow partnerships and infrastructure. • Focus on workforce development.